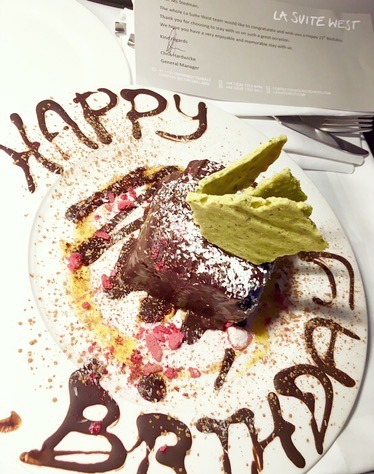 I am lucky enough to have an absolutely fantastic mum who is excellent at planning adventures and treats, and for my birthday she organised for us to stay in La Suite West, a London hotel specialising in vegan food in it’s restaurant RAW. The hotel was fabulous upon arrival, with plush, soft beds, a huge shower and a stylish minimalist monochrome theme. But best of all, there was CAKE waiting for me when I got there, accompanied by a note wishing me a happy 21st, which was such a special touch. The cake was delicious, once I cracked through the chocolate coating topped with pistachio shards, this amazingly sweet and decadent syrupy vanilla sponge greeted me … what a treat. Because you can never have too much cake on your birthday, we then headed down to the restaurant to enjoy their fully vegan afternoon tea. The afternoon tea includes a selection of finger sandwiches, scones with strawberries and cream, a selection of cakes and, of course, your choice of tea, as well as a glass of non-alcoholic bubbly. You can take a look at the full menu here. Without a doubt my favourite part of the afternoon tea was the scones, they were so light and sweet, flavoured with subtle spices and served warm with whipped coconut cream. I almost certainly helped myself to more than my fair share (but it was my birthday after all!). Having stayed overnight in La Suite West, we headed back to the restaurant in the morning for breakfast. I must admit, considering the quality of the afternoon tea, I was a bit disappointed by the breakfast which wasn’t particularly vegan friendly. The continental breakfast includes almost no vegan options, with an array of pastries, meats, dairy cheeses & yoghurts, the only option for me was a fruit salad. Consequently, I ordered a vegan cooked breakfast, which was tasty enough, with scrambled tofu and what appeared to be Linda McCartney sausages, but nothing my own culinary skills couldn’t have surpassed at home.